Zion National Park is a national park located in the Southwestern United States, near Springdale, Utah. 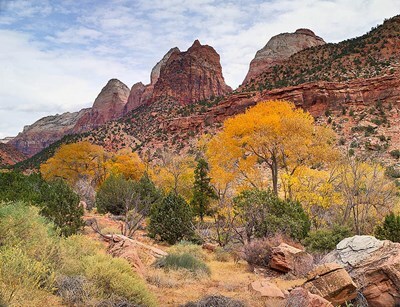 A prominent feature of the 229-square-mile (593 km) park is Zion Canyon, 15 miles (24 km) long and up to half a mile (800 m) deep, cut through the reddish and tan-colored Navajo Sandstone by the North Fork of the Virgin River. The lowest elevation is 3,666 ft at Coalpits Wash and the highest elevation is 8,726 ft at Horse Ranch Mountain. This description uses material from the Wikipedia article on Zion National Park and is licensed under the Creative Commons Attribution-ShareAlike License (view authors).